The media is full of misconceptions about the Millennial generation, particularly when it comes to their home-buying habits. It’s true that while in their 20s, Millennials have been reluctant to buy homes. Between the lack of jobs after the recession, the incredible size of student loan debt among this population, and shifts in the cultural mindset about homeownership, many people predicted that owning homes was something that Millennials just wouldn’t do. As a result, many home improvement franchises have focused the lion’s share of their marketing efforts towards the Baby Boomers. While it is true that those born between 1946 and 1964 are the biggest spenders on home improvement projects, as Millennials enter their 30s, more and more are buying homes, and they are far more likely to complete renovations on their new homes. Homeownership among Millennials is climbing, and it is set to continue this trend. Right now, one in four Millennials are homeowners, and of those who do not own homes, 88 percent want to buy one in the future. Abolish the belief that this generation is one that doesn’t want to own homes. In reality, Millennials are powering the housing market, and it’s important for everyone in the home improvement industry to factor in their influence in choosing products and marketing strategies. While homeowner rates among Millennials continue to grow, they are also the generation who is most likely to remodel their homes, and are more likely to take on multiple home improvement projects. According to HomeAdvisor, five out of six Millennials who responded to their survey reported that they plan to spend as much, if not more, on home improvement projects than they did the year before, with more than half reporting that they will spend more. While Baby Boomers continue to lead the pack in terms of spending, being more inclined towards projects like kitchen remodels, Millennials are set to eclipse this as they grow older. Due to the precarious financial situation of many of this generation, most are compromising on their starter homes in terms of condition and size. This means that many Millennials are currently interested in upgrading as their income grows, but due to rising mortgage rates, they are not selling and moving. Instead, they are making changes to their current homes to become more efficient and aesthetically pleasing. In the coming years as more of this generation enter their 30s and become more stable in their careers, the home improvement industry is set to grow exponentially as these individuals choose to make renovations to create their dream home, rather than rely on the tumultuous housing industry to buy a new one. Millennials grew up as the internet began to boom, and as a result, they are much more tech-savvy than their parents. In addition, they prioritize environmental friendliness, budget friendliness, and security in their home design. This means that more and more are opting to use smart home technology, setting them up for many home improvement projects as they install this tech into their houses. Home improvement franchises can keep ahead of the curve by stocking products that accommodate the growing need for technology. In addition, Millennials are far more likely to draw inspiration from their peers. The internet has made it easy to see what others are doing to make their homes havens. In particular, Pinterest is a popular social media platform where home improvement junkies gather to share photos, videos, and ideas for different renovations and DIY projects. This makes it much easier to market to this demographic, because their interests are readily available for those in the home improvement industry to draw inspiration from. While any generation can benefit from home improvement, it’s imperative for those in the home improvement industry to recognize the opportunity for clientele among the Millennial generation. 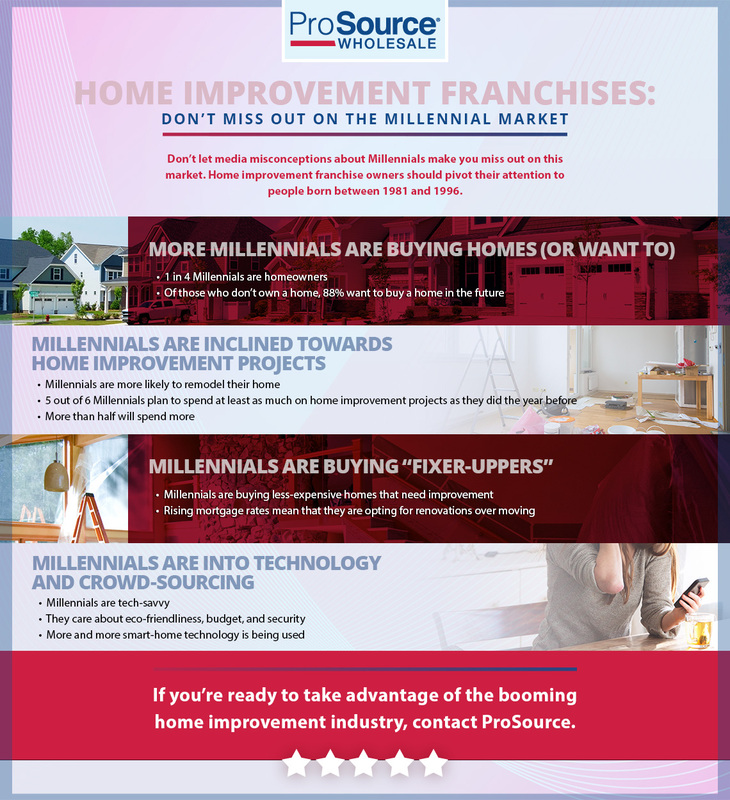 If you’re ready to take advantage of the booming home improvement industry, ProSource would love to help you with one of the best franchise opportunities out there. If you are a qualified, highly motivated person, we are interested in speaking with you about our home improvement franchise! Contact us today to get started.